MHC class II (MHC II) proteins are competent signaling molecules on APC. However, little is known about the mechanisms that control generation of their activating signals. Previous reports highlighted a number of factors that could affect the nature and outcome of MHC II signals, including the inability of MHC II ligation on resting vs activated murine B cells to induce mobilization of Ca2+. In the present study, we report that ligation of MHC II on resting murine B cells reproducibly induces mobilization of intracellular Ca2+ using both mAbs and cognate T cells as ligands. Mobilization of Ca2+ was independent of MHC II haplotype, isotype, or mouse genetic background. MHC II-mediated mobilization of Ca2+ is completely inhibited by inhibitors of src-like kinases and syk, and MHC II ligation increases overall tyrosine phosphorylation level. Moreover, MHC II ligation results in specific up-regulation of CD86. However, induction of these responses is dependent on the type of anti-MHC II Ab used, suggesting that epitope specificity and/or the nature of ligation is important. Moreover, we demonstrate that MHC II-derived signals are strictly regulated by the order and timing of BCR and CD40 signals, suggesting coordination of these signals preserves the integrity of early B cell priming events. Thus, the mode and the context of MHC II ligation influence generation of MHC II-derived activating signals in resting B cells. Based on these results, a new model that highlights the role of MHC II-activating signals in regulation of Ag presentation by B cells is proposed. In addition to their classical function in Ag presentation of protein-derived peptide fragments, MHC class II (MHC II)4 molecules are competent signaling molecules on Ag presenting cells. In human and mouse B cells, ligation of MHC II by Abs or the TCR generates downstream signals that could affect activation status and survival of B cells (1, 2). The nature of the signals generated following MHC II ligation by Abs or the TCR has been examined in a variety of cells. MHC II transduces signals including the production of cAMP (3, 4), leads to tyrosine kinase activation, inositol lipid hydrolysis and mobilization of Ca2+ (5, 6, 7, 8), and induces increase in ERK 1/2, AP-1, and NF-κB activities (9, 10, 11). The outcome of MHC II-mediated signals includes increased expression of costimulatory molecules, such as CD86 (12), increased cell-cell adhesion through up-regulation of LFA-1 (13), induction of B cell differentiation (4), and cell death (1, 2, 14). However, a number of factors could influence the magnitude, nature, and functional outcomes of MHC class II-mediated signals. These include B cell activation status (15, 16), species differences (8, 15), B cell transformation (8), MHC II haplotype or isotype (4, 9, 17), and signals generated from other cell surface receptors, including the BCR (18) or CD40 (19). Additionally, other factors such as the uptake and processing of Ag may influence the context in which MHC II is found in the plasma membrane and, as a result, dictates the functional outcome of MHC II-mediated signals in B cells. Consistent with the latter, we previously showed that targeting of Ag to the BCR generates MHC II-peptide complexes that upon ligation by Ab or the TCR induce B cell activation and survival. In contrast, ligation of MHC II complexes generated by fluid phase uptake of the Ag induces B cell death in culture (2). Therefore, induction of MHC II signals involves a complex mechanism that is influenced by a number of factors that ultimately dictate B cell function. In the present study, we examine in nontransformed (primary) B cells a number of factors that could influence the context in which ligation of MHC II generates intracellular Ca2+ signals. MHC II-derived signaling is examined following ligation by different types of mAbs and by cognate T cells. Mobilization of Ca2+ was examined in cells from mice of different haplotypes and in both resting and activated B cells. We report for the first time that ligation of MHC II on the surface of resting unstimulated murine B cells reproducibly induces mobilization of intracellular Ca2+. This is found to be independent of the MHC II haplotype or isotype. Furthermore, MHC II ligation induces an increase in overall cellular tyrosine phosphorylation levels, and inhibition of src-like kinases and syk inhibits the MHC II-induced Ca2+ response. Ligation of MHC II also increases specific expression of the activation marker CD86. These results demonstrate that like resting human B cells (8, 20), MHC II on the surface of resting mouse B cells is a competent signaling molecule for induction of activating signals. However, consistent with other studies, some mAbs were not able to induce mobilization of Ca2+ or increase expression of CD86, suggesting that binding to specific epitopes and/or the nature of MHC II ligation is important. In analyzing the level of MHC II signaling, we found that MHC II-derived Ca2+ signaling and surface expression of MHC II are negatively regulated by prior simultaneous signals via the BCR and CD40. However, prior signaling via either BCR or CD40 alone did not negatively regulate MHC II-derived Ca2+ signaling. Furthermore, prior BCR signaling followed by simultaneous signaling via MHC II and CD40, a procedure that mimics engagement of T cells following B cell priming by Ag, did not affect MHC II-derived Ca2+ signaling. These results indicate that the three signals are well coordinated in Ag-specific B cells to preserve the integrity of early B cell priming events and to promote appropriate B-T cell interactions. BCR transgenic mice (MD4.B10.BR, μa, H-2k) expressing hen egg lysozyme (HEL)-specific BCR that have been bred onto the B10 background over 15 generations were used with their nontransgene littermates from 8 to 14 wk of age. BALB/cJ (H-2d) and CBA/J (H-2k) mice were used at 8 wk of age. Mice were housed under specific-pathogen free conditions in the Albany Medical College Animal Resources Facility. Biotin-anti-mouse IAk (11-5.2, mouse IgG2b and 10-3.6, mouse IgG2a), biotin anti-mouse IEk (14-4-4s, mouse IgG2a), biotin anti-mouse IAd (AMS-32.2, mouse IgG2b), FITC anti-mouse IAk isotype-matched control (mouse IgG2b), PE anti-mouse CD86 (GL1, rat IgG2a), PE rat IgG2a isotype control (IC) (R35-95), pure mouse IgG2a IC (MOPC-173), FITC-anti-mouse CD54 (3E2, hamster IgG1), FITC-hamster IgG1 IC (A19-3), pure hamster anti-mouse CD40 (HM40-3), biotin anti-mouse CD40 (3/23, rat IgG2a), pure anti-mouse CD16/CD32 (rat IgG2b, NA/LE), and FITC streptavidin (SA) (all from BD Pharmingen). Goat anti-mouse μ F(ab′)2, FITC donkey anti-rabbit F(ab′)2, rabbit anti-mouse IgG F(ab′)2, and SA were obtained from the Jackson ImmunoResearch Laboratories. 7.6 mAb (mouse IgG2a) (a gift from Dr. J. C. Grivel, National Institute of Allergy and Infectious Diseases, Bethesda, MD) and anti-mouse IAk (10-2.16, mouse IgG2b) were ammonium sulfate precipitates from culture supernatant. Pure rabbit anti-phosphotyrosine, fix, and permeabilization buffers were purchased from BD Biosciences. Thapsigargin, Fluo-3, and Fura Red were obtained from Molecular Probes. The syk-kinase inhibitor 3-(1-methyl-1H-indo-3-yl-methylene)-2-oxo-2,3-dihydro-1H-indole-5-sulfonamide (no. 574711) was purchased from Calbiochem. The src-kinase inhibitor PP1 was purchased from BIOMOL. HEL was obtained from Sigma-Aldrich. HEL46–61 peptide was purchased from AnaSpec. 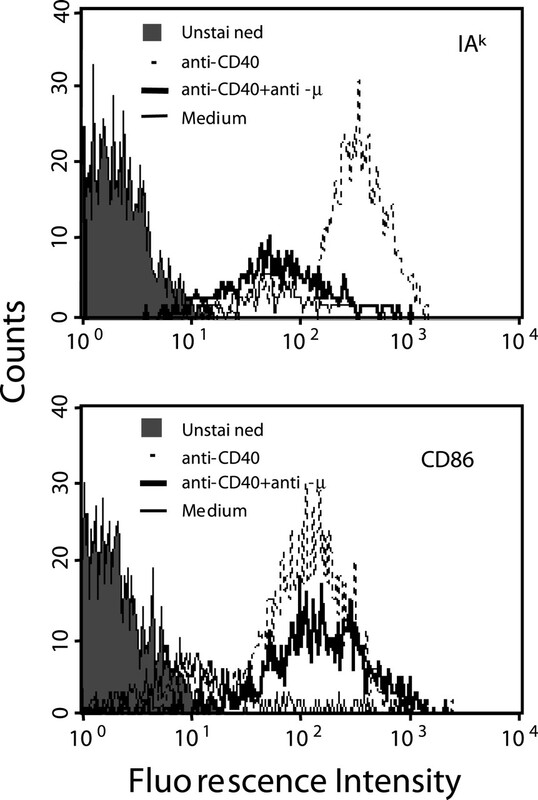 B cells were purified by negative selection from splenic cell suspensions with MACS anti-CD43 Ab-conjugated microbeads. Ab-conjugated magnetic beads were then fractionated on columns according to instructions supplied by the manufacturer. Fractionated B cells were >90% B220+, as determined by flow cytometry. Furthermore, the resting status of these cells was confirmed by detection of basal levels of CD86 on the cell surface by FACScan flow cytometer (BD Biosciences). Intracellular calcium levels were measured by monitoring the level of fluorescence of the Ca2+ sensitive dyes Fluo-3 and Fura Red. Splenic or pure splenic B cells were loaded with Fluo-3/AM (2 μg/ml) and Fura Red/AM (4 μg/ml) in Ca2+ buffer containing 5% FCS and incubated for 30 min at 37°C. After washes, cells were aliquoted to 1 × 106/ml and rested in Ca2+ buffer for 30 min at room temperature. FcγR was blocked by incubation with 10 μg/ml 2.4G2 for 5 min. Using flow cytometry, a baseline measurement was taken for the first 25 s. After addition of stimulants, data acquisition continued for the duration of time indicated in the figure legends. The relative level of free intracellular calcium was determined by calculating the ratio of Fluo-3 to Fura Red fluorescence (FL1:FL3) using the FlowJo software package (Tree Star). Cells were labeled with Ca2+ binding dyes, washed, and rested for 30 min as described above. FcγR was blocked with 10 μg/ml 2.4G2 mAb. Subsequently, increasing concentrations (as indicated in the figure legends) of biotin-labeled anti-MHC II mAbs were added and incubated for 5 min to allow binding. A baseline response was established for 25 s, after which an excess amount of 10 μg/ml SA was added. Washing cells after incubation with biotin anti-MHC II mAbs produced similar results. For non-biotin 10-2.16 mAb, 10 μg/ml rabbit anti-mouse IgG F(ab′)2 was used as a secondary reagent instead of SA. Alternatively, a baseline response was first established for 25 s, then acquisition was continued after addition of 5 μg/ml of each of the anti-MHC II mAbs in the absence of SA or another secondary reagent. Pure splenic B cells were isolated as described above. Cells were incubated with and without a final concentration of 300 μM HEL46–61 peptide for 3.5 h at 37°C. Cells were gently washed and labeled with Fluo-3/AM (2 μg/ml) as described above. The T cell hybridoma H4Ly 50.5 (a gift from Dr. W. Wade, Dartmouth Medical School, Lebanon, NH) that recognizes HEL46–61 peptide bound to IAk was used. Both B and T cells were resuspended in Ca2+ buffer. T cells (2 × 105) were allowed to adhere for 15 min on glass coverslips pretreated with 1 μg/ml poly-l-lysine. Measurement of intracellular Ca2+ was performed just before and continued after dropping B cells on top of adherent cells using LSM 510 Meta microscope (Carl Zeiss) and LSM Imaging system. To visualize B and T cell interactions, differential interference contrast images were taken every 10 s concomitantly with fluorescence images. Imaging was stopped after 10 min. To examine effects from ligation of MHC II by the 11-5.2 mAb, B cells were incubated with the Ab for 2 min and then were made adherent to coverslips. Ca2+ mobilization was observed following addition of SA. To address effects following BCR ligation, pure B cells were incubated for either 10 min, 150 min, or overnight at 37°C with either 10 μg/ml polyclonal goat anti-μ F(ab′)2 Ab (nontransgenic) or with increasing concentrations (as indicated in the figure legends) of an anti-idiotypic mAb (7.6 mAb) or its IC, mouse IgG2a (transgenic). In the case of 150 min and overnight incubations, cells were cultured in RPMI 1640 supplemented with 50 μM 2-ME and 0.5% autologous mouse serum. Subsequently, FcγR was blocked with 2.4G2 after incubation of the cells for 5 min at room temperature followed by 7.6 mAb for the indicated time above. Cells were then labeled with Ca2+ binding dyes as described above. Subsequently, increasing concentrations of biotin 11-5.2 mAb (as indicated in the figure legends) were added to the cells for 5 min to allow binding of the Ab followed by an excess amount of SA (10 μg/ml). For direct induction of Ca2+, 10 μg/ml polyclonal goat anti-μ F(ab′)2 or increasing concentrations of 7.6 mAb (as indicated in the figure legend) were used after taking measurement of baseline response. To examine whether pretreatment with goat anti-μ depletes Ca2+ from intracellular stores, B cells were incubated for 10 min with 10 μg/ml of the Ab or left untreated. After a baseline response was established, 0.4 μM thapsigargin was added. To examine the effects of preligation of the BCR on subsequent Ca2+ signal from MHC II and CD40, B cells were isolated from HEL-transgenic mice and incubated overnight with increasing concentrations of 7.6 mAb (as indicated in the figure legend) in cell culture medium containing 0.5% of autologous mouse serum. Cells were then washed and labeled with Ca2+ binding dyes, washed, and rested for 30 min. FcγR was blocked with 2.4G2 mAb. After a baseline measurement was taken, 5 μg/ml biotin 11-5.2 mAb (anti-IAk) and 4 μg/ml hamster anti-CD40 mAb were added and incubated for 10 min to allow binding. Mobilization of Ca2+ was then measured after addition of SA, as described above. To examine effects of concomitant preligation of the BCR and CD40 on MHC II-derived Ca2+ response, nontransgenic B cells were incubated with 10 μg/ml polyclonal goat anti-μ and 4 μg/ml hamster anti-CD40, 10 μg/ml anti-μ, or 4 μg/ml anti-CD40 overnight. Cells were cultured in RPMI 1640 containing 0.5% autologous mouse serum. After labeling with Ca2+ dyes, 5 μg/ml biotin 11-5.2 mAb (anti-IAk) was added and incubated for 5 min, followed by 10 μg/ml SA. In the case where HEL was added to cells, B cells were isolated from HEL-transgenic mice and their nontransgenic littermates. Cells were incubated with either 100 nM (transgenic) or 100 μM (nontransgenic) of HEL in the presence of 4 μg/ml hamster anti-CD40 mAb or in its absence. Cells were cultured as above. After overnight incubation, mobilization of Ca2+ was measured following addition of 5 μg/ml biotin 11-5.2 mAb and SA, as described above. Pure B cells were labeled with Ca2+ binding dyes as described above. Cells were then incubated in the absence or in the presence of previously determined concentrations of 10 μM PP1 (Src-kinase inhibitor), 100 nM Syk-kinase inhibitor, or in an equivalent volume of the vehicle DMSO for 30 min at 37°C. Cells were washed and incubated with 10 μg/ml 2.4G2 mAb to block FcγR. Subsequently, 4 μg/ml each of biotin 11-5.2 (anti-IAk) or biotin AMS-32.1 (anti-IAd) was added to cells and incubated for 5 min to allow binding. A total of 10 μg/ml SA was added after a baseline response was established for 25 s.
For measurement of phosphotyrosine level, B cells were isolated from spleens of nontransgenic mice and incubated in PBS without protein for 15 min at 37°C, followed by 10-min incubation at room temperature. Cells were then incubated with 4 μg/ml biotin 11-5.2 mAb (anti-IAk) at room temperature for 2 min to allow binding. Cells were then stimulated with 10 μg/ml SA for an additional 2 min. Negative controls included cells incubated with 4 μg/ml of a mAb against an irrelevant MHC II haplotype (biotin AMS-32.1, anti-IAd) or cells incubated without the primary Ab (unstimulated). As a positive control, 10 μg/ml goat anti-μ F(ab′)2 was used. The procedure for staining with anti-phosphotyrosine Ab was followed according to the manufacturer’s instructions (BD Biosciences) with some modifications. Briefly, cells were fixed, permeabilized, and incubated at room temperature with a previously optimized concentration of 0.5 μg/ml polyclonal rabbit anti-phosphotyrosine Ab followed by 6 μg/ml FITC donkey anti-rabbit F(ab′)2. Cells were then analyzed by flow cytometry. To examine effects following ligation of MHC II on expression of CD86 and CD54, B cells were isolated from nontransgenic mice and resuspended in cell culture medium in the presence of 0.5% mouse autologous serum. FcγR was blocked after incubation with 10 μg/ml 2.4G2 mAb for 5 min at room temperature. A total of 10 μg/ml of either biotin 10-3.6 or biotin 11-5.2 was then added. The cultures were incubated for an additional 5 min before addition of 10 μg/ml SA. In additional wells, cells were either stimulated with 10 μg/ml goat anti-μ Ab or left unstimulated. Plates were then incubated for ∼18 h. Cells were harvested, counted, and labeled with optimum concentrations of PE anti-CD86 or FITC anti-CD54 or their isotype-matched controls. Pure B cells were isolated from nontransgenic mice and cultured for 40 h in RPMI 1640 containing 0.5% autologous mouse serum with 5 μg/ml hamster anti-CD40, hamster anti-CD40 + 10 μg/ml goat anti-μ F(ab′)2, or left untreated. Cells were then labeled with an optimum concentration of FITC anti- MHC II or PE anti- CD86 mAbs, or their isotype matched controls. Like surface BCR molecules, MHC II signaling is mediated by early phosphorylation events via the src family protein kinase Lyn and phosphorylation of Syk (5, 6, 7, 8). However, differences in coupling of MHC II molecules to the protein tyrosine kinase (PTK)-dependent signaling pathway in human vs mouse appear to exist. In contrast to resting human B cells (8, 20), MHC II ligation on resting unstimulated mouse B cells does not appear to increase protein tyrosine phosphorylation or induce mobilization of intracellular Ca2+ (5, 15, 16). Instead, MHC II ligation in these cells results in translocation of protein kinase C (PKC) to the nucleus that has been linked to induction of cAMP (3). Enhancement of intracellular cAMP levels before BCR ligation has inhibitory effects on both 1,4,5-inositol triphosphate induction and mobilization of intracellular Ca2+ (21), suggesting that induction of cAMP at early stages of B cell activation by Ag might be counterproductive. In the present study, we further investigate whether the nature of MHC II ligation and the context in which MHC II signals are generated dictate mobilization of Ca2+ in freshly isolated mouse B cells. To minimize factors that could introduce a bias in our analysis, we examined MHC II ligation and its effects on mobilization of intracellular Ca2+ in both splenic and pure B cells. Splenic cells from mice of different genetic backgrounds, including CBA and B10.BR (IAk) and cells from mice of a different haplotype BALB/c (IAd), were isolated and labeled with Ca2+-sensitive dyes. After blocking FcγR with 2.4.G2 mAb, biotin anti-MHC II mAbs (either anti-IAk (11-5.2) or anti-IAd (AMS-32.1)) were added at increasing doses either alone or followed by SA. The addition of 2.4G2 or SA alone did not induce any noticeable elevation in Ca2+ (data not shown). Similarly, addition of each of the mAbs alone (in the absence of SA) did not induce mobilization of Ca2+ (Fig. 1⇓). This is consistent with previous studies that indicated a higher degree of ligation of MHC II is required to induce elevation of Ca2+ in B cells (22). Additionally, further ligation of each of the mAbs with SA induced a significant elevation in intracellular Ca2+ (Fig. 1⇓a). The Ca2+ response was dose dependent, and the peak of the Ca2+ response declined after 3 min (Fig. 1⇓a, inset). It should be noted that the detected Ca2+ response represents mobilization from intracellular stores because there was little effect on level and kinetics of the MHC-induced Ca2+ response in the absence of extracellular Ca2+ (data not shown). Ligation of MHC II induces mobilization of Ca2+ in resting mouse B cells independent of genetic background, haplotype, and isotype. Splenic cells (a) or pure B cells (b) from mice of different genetic background (CBA and B10.BR, IAk) or different MHC II haplotype (BALB/c, IAd) were isolated. a, Splenic cells were labeled with Ca2+ binding dyes (Fura Red = FL3 and Fluo3 = FL1) for 30 min at 37°C. Cells were washed and rested for 30 min. FcγR was blocked with 2.4G2 mAb. Subsequently, an increasing dosage of 2.5 (dotted line), 5 (dashed line), 7.5 (solid line) (except B10.BR), and 10 (bold line) μg/ml biotin anti-IAk (11-5.2) or anti-IAd (AMS-32.1) mAbs were added and incubated for 5 min to allow binding. A baseline response was established for 25 s, after which SA was added. Alternatively, a baseline response was first established for 25 s, then 5 μg/ml of each of the anti-MHC II mAbs was added in the absence of SA. Analysis of Ca2+ was performed over a total of 3 min. To analyze the kinetics of the Ca2+ response (inset in Fig. 1a), cells were ligated with biotin 11-5.2 mAb and SA. Measurement of Ca2+ was determined over 9.5 min. b, Pure B cells were treated as above. A total of 1 (dotted line), 2 (dashed line), 4 (solid line), and 8 (bold line) μg/ml biotin 11-5.2 (anti-IAk, CBA), or 2 (dotted line), 4 (dashed line), and 8 (bold line) μg/ml biotin 14-4-4S (anti-IEk, B10.BR), or 0.5 (dotted line), 1 (dashed line), 2 (solid line), and 4 (bold line) μg/ml biotin anti-IAd (AMS-32.1, BALB/c, IAd) was used. Similarly, 5 μg/ml of each of the anti-MHC II mAbs was added in the absence of SA. The addition of SA or 2.4G2 mAb did not induce an elevation of Ca2+ level (data not shown). Analysis of Ca2+ was performed over 3 or 6 min (as indicated). Each trace represents the average readings of Ca2+ oscillations. The results above are representative of over 20 experiments using 11-5.2 mAb and at least three experiments for the other mAbs. Ligation of MHC II on pure B cells from these mice showed a similar pattern as in splenic B cells. Ligation of either anti-IAk or anti-IAd induced mobilization of Ca2+ (Fig. 1⇑b). Similarly, ligation of an anti-MHC II isotype mAb (anti-IEk, 14-4-4S) also increased Ca2+ levels (Fig. 1⇑b). These results demonstrate that ligation of MHC II on the surface of resting unstimulated mouse B cells induces mobilization of Ca2+. Additionally, this response is independent of genetic background, haplotype, and isotype of MHC II. The increased elevation in Ca2+ following MHC II ligation by the 11-5.2 mAb has been noted in >20 experiments, including those shown in Fig. 1⇑. In addition to the anti-MHC II mAbs used above, other anti-MHC II mAbs, including 10-2.16 and 10-3.6 (anti-IAk) and D3.137 (anti-IAd/b), have been reported to induce translocation of PKC from the cytoplasm to the nucleus (23), which is facilitated by increased levels of cAMP (3). However, in these studies anti-MHC II Abs were used without further ligation. Nevertheless, in other studies, ligation of biotin D3.137 mAb bound to unprimed murine B cells by SA failed to induce a Ca2+ response in the majority of the cells (15, 16). In contrast, in activated cells such as the K46J B cell line or primary mouse B cells primed by BCR ligation (in the presence or in the absence of IL-4), ligation of MHC II by cross-linked D3.137 mAb induced an increase in tyrosine phosphorylation activity and elevation in intracellular Ca2+ level (15, 16). These studies concluded that MHC II molecules transduce signals via two distinct mechanisms dependent on the B cell activation status. To further elucidate the influence of the type of mAb used and effects on the Ca2+ response, we compared the induction of Ca2+ by 11-5.2, 10-3.6, and 10-2.16 (all anti-IAk) upon additional cross-linking. Biotin 11-5.2 and 10-3.6 were cross-linked by SA, whereas 10-2.16 mAb was ligated with rabbit anti-mouse IgG. Cells were stimulated either with the mAbs alone (no second layer) or with the mAbs plus additional cross-linking, as described above. As predicted, ligation of the BCR by a polyclonal Ab alone induced a noticeable increase in the intracellular Ca2+ level compared with the baseline response (Fig. 2⇓a). The kinetics of this response is consistent with that induced in primary B cells, i.e., the kinetic of the Ca2+ response in primary B cells shows a more prolonged phase of return to base level (24). Ligation of MHC II with the 11-5.2 mAb also induced an elevation in Ca2+ level similar to the results in Fig. 1⇑ (Fig. 2⇓b). In contrast, ligation of MHC II with 10-3.6 (Fig. 2⇓c) or 10-2.16 (Fig. 2⇓d) mAbs failed to induce a detectable Ca2+ flux at similar range of concentrations used for the 11-5.2 mAb. This was not due to lack of binding of the 10-3.6 and 10-2.16 mAbs as these Abs bound to cell surface MHC II at the concentrations used to induce mobilization of Ca2+ (data not shown). The absence of a Ca2+ response is consistent with the outcome of ligation of MHC II by the D3.137 mAb in resting mouse B cells (15, 16). These results suggest that higher order of ligation is not sufficient to induce a Ca2+ response. Alternatively, it is possible that the noted cAMP-dependent signaling following ligation of MHC II by 10-2.16, 10-3.6, and D3.137 (23) may explain their inability to induce mobilization of Ca2+ in resting mouse B cells. However, one major difference in our study compared with the other studies (3, 23) is that we report effects on mobilization of Ca2+ using biotinylated mAbs and SA (including the 10-3.6 and 10-2.16 mAbs), whereas the previous reports used these mAbs without any further ligation, a procedure that resulted in an increase in cAMP level. Additionally, cAMP responses appear to be important in later stages of B cells activation, i.e., their differentiation into Ab-secreting cells (4), and have been shown to inhibit BCR- or mitogen-induced B cell activation (21). As such, the generation of strong cAMP signals at early stages of B cell activation might be counterproductive. However, the precise mechanisms responsible for the inability of 10-2.16 and 10-3.6 to induce mobilization of Ca2+ remain to be determined. Differential effects on mobilization of Ca2+ and on expression of CD86 by different mAbs specific for the same MHC II haplotype. Pure B cells were labeled with Ca2+ binding dyes (Fura Red = FL3 and Fluo3 = FL1) for 30 min at 37°C. Cells were washed and rested for 30 min. FcγR was blocked with 2.4G2 mAb. Cells were then incubated with 10 μg/ml goat anti-μ F(ab′)2 (a) or 1 (dotted line), 2.5 (dashed line), 5 (solid line), and 10 (bold line) μg/ml each of biotin 11-5.2 (b) and biotin 10-3.6 mAbs (c) or 1, 2.5, 5, 10, and 20 (long dashed line) μg/ml unconjugated 10-2.16 mAb (d) for 5 min to allow binding. A baseline response was taken for 25 s followed by addition of SA to 11-5.2 and 10-3.6 mAbs or rabbit anti-mouse IgG F(ab′)2 to 10-2.16 mAb. Analysis was performed over 3 min. Each trace represents the average reading of Ca2+ oscillations. To examine effects on CD86 expression, pure B cells were isolated. FcγR was blocked with 2.4G2 mAb. Cells were incubated for 5 min with 10 μg/ml of either biotin 10-3.6 or biotin 11-5.2 to allow binding. Cells were then stimulated by addition of 10 μg/ml SA. In additional wells, cells were either stimulated with 10 μg/ml goat anti-μ Ab or left untreated and incubated for ∼18 h at 37°C. Cells were then labeled with predetermined concentrations of PE anti-CD86 (e) or FITC anti-CD54 (f) or corresponding concentrations of isotype-matched controls (data not shown) and analyzed by flow cytometry. Shaded histogram represents “medium”; solid line, biotin 10-3.6; bold line, biotin 11-5.2; dashed line, goat anti-μ. The data in a–c and d–f represent at least four and three other similar experiments, respectively. Although the results above demonstrated that the mode of MHC II ligation has differential outcome on mobilization of intracellular Ca2+, we examined the physiological relevance of the intracellular Ca2+ signal. Because there is a direct and strong correlation between level of intracellular Ca2+ level and increased expression of CD86 (a costimulatory molecule expressed at high concentration on activated B cells and is essential for T cell stimulation) (24), the effects of ligation of MHC II with 10-3.6 and 11-5.2 mAbs on CD86 expression were examined. For comparison, the effects of these mAbs on expression of CD54, an adhesion molecule shown by us to be regulated after ligation of MHC II-peptide (2), were also examined. Cells were stimulated with biotin anti-MHC II followed by SA and then incubated at 37°C for 18 h. Analysis of the cell markers revealed noticeably higher expression of CD86 in the presence of 11-5.2 mAb or anti-μ (as a positive control) compared with medium (which had basal expression of CD86) (Fig. 2⇑e). In contrast, similar incubation with 10-3.6 mAb failed to induce increased expression of CD86. Furthermore, while as expected the incubation with anti-μ Ab increased expression of CD54 (Fig. 2⇑f), the expression of this marker was not altered by the treatment of either anti-MHC II mAb, demonstrating the specificity of the differential effect on CD86 expression. The inability of the anti-MHC II mAbs to regulate CD54 expression is consistent with absence of effects on level of expression of this marker using the anti-MHC II-HEL46–61 (C4H3 mAb) in BCR-transgenic but not in the nontransgenic cells (2) in which CD54 level was down-regulated. These differences in the ability of anti-MHC II mAbs to regulate CD54 expression highlight again the importance of the context in which MHC II is ligated. The results also suggest that the failure of 10-3.6 mAb to induce CD86 may be due to its inability to induce mobilization of Ca2+. Overall, the results demonstrate the physiological relevance of intracellular Ca2+-based MHC II signaling in B cell activation, as measured by CD86 expression. A well-characterized model for receptor ligation and effects on downstream events is exemplified by the BCR. The primary events that follow ligation of the BCR by Ag or Ab include clustering of associated src-family kinases, leading to phosphorylation of ITAM tyrosines on noncovalently associated disulfide-linked heterodimers of CD79a and CD79b (25). This further recruits and activates the tyrosine kinase syk. Syk is crucial for activation of Btk and the phospholipase Cγ pathway. Phosphorylation of the latter molecule and its translocation to the plasma membrane generates inositol-1,4,5-triphosphate and mobilization of Ca2+ from the endoplasmic reticulum (24). Similar events to those described for the BCR have been observed following ligation of MHC II on resting human or activated mouse B cells (5, 6, 7, 8, 20). Moreover, the CD79 adaptor molecules have been shown to associate with MHC II following Ag priming of resting mouse B cells (16). This indicates that the BCR and MHC II molecules share at least early signaling events that lead to mobilization of intracellular Ca2+. To address whether the elevation in intracellular Ca2+ level detected upon MHC II ligation is mediated by an increase in tyrosine kinase activation, we perform measurement of the anti-MHC II-induced Ca2+ response in cells pretreated with PP1, a src-kinase inhibitor, or with a potent syk inhibitor. Cells were treated with a previously determined effective inhibitory dose of the reagents (data not shown, Fig. 3⇓a) and stimulated with doses of anti-MHC mAbs that induce mobilization of Ca2+ (Fig. 1⇑). Fig. 3⇓a shows that treatment of mouse B cells with 10 μM PP1 (Fig. 3⇓, aa and ab) completely inhibited the MHC II-induced Ca2+ response in cells of different MHC II haplotypes compared with cells treated with the vehicle, DMSO. Furthermore, treatment with 100 nM of a potent syk inhibitor resulted in similar outcome (Fig. 3⇓ac). Effects of src- and syk- kinase inhibitors on MHC II-derived mobilization of Ca2+ and MHC II ligation on overall phosphotyrosine levels. a, Src- and syk-kinase inhibitors inhibit mobilization of Ca2+ induced following MHC II ligation on resting mouse B cells. Pure B cells were labeled with Ca2+ binding dyes (Fura Red = FL3 and Fluo3 = FL1), as described above. Cells were then incubated in absence or presence of previously determined concentrations of 10 μM PP1 (src-kinase inhibitor), 100 nM of the syk-kinase inhibitor (Calbiochem no. 574711) or in equivalent volume of the vehicle DMSO. FcγR was blocked with 2.4G2 mAb. Subsequently, cells were incubated with biotin 11-5.2 (anti-IAk) (a and c) or biotin AMS-32.1 (anti-IAd) (b) to allow binding. A baseline response was established for 25 s, after which SA was added. Analysis of Ca2+ was performed over a total of 3 min. Shown are traces representing the average of Ca2+ oscillations. The data in a, b, and c represent six, two, and two similar experiments, respectively. b, Ligation of MHC II on resting mouse B cells induces an increase in overall phosphotyrosine levels. Pure B cells were isolated and incubated for 2 min with biotin 11-5.2 mAb (anti-IAk) to allow binding. Cells were stimulated with SA for an additional 2 min (a protocol that induces elevation in Ca2+ level). Negative controls included cells incubated with a biotin mAb against an irrelevant MHC II haplotype (AMS-32.1, anti-IAd) or cells incubated without the primary Ab (unstimulated). As a positive control, goat anti-μ F(ab′)2 was used. Cells were then fixed, permeabilized and incubated with polyclonal rabbit anti-phosphotyrosine Ab followed by FITC donkey anti-rabbit F(ab′)2. Cells were then analyzed by flow cytometry. Shaded histogram represents unstimulated cells. The increase in fluorescence activity was calculated as a percentage over unstimulated cells (100%). The results are representative of two similar experiments. To examine direct effects of MHC II ligation on phosphotyrosine levels, pure B cells were isolated and incubated with 4 μg/ml biotin 11-5.2 mAb followed by addition of 10 μg/ml SA for an additional 2 min (a protocol that induces elevation in Ca2+ level; Fig. 1⇑). Cells were then fixed, permeabilized, and incubated with polyclonal rabbit anti-phosphotyrosine Ab followed by FITC-conjugated donkey anti-rabbit F(ab′)2. As shown (Fig. 3⇑, ba and bb), ligation of the BCR or 11-5.2 mAb induced a noticeable increase in overall tyrosine phosphorylation level (75 and 35% above basal level, respectively). In contrast, treatment of cells with an unrelated anti-MHC II mAb, such as anti-IAd, induced a negligible increase (6%; Fig. 3⇑bc), and no activity was detected following incubation with the secondary Ab (donkey anti-rabbit) alone (data not shown). Overall, we conclude that ligation of MHC II on resting unprimed B cells induces an increase in overall tyrosine phosphorylation and causes an elevation of intracellular Ca2+ levels that is inhibited by inhibitors of tyrosine kinases. The primary events that characterize generation of an immune response following introduction of an Ag in vivo involve acquisition of Ag by dendritic cells (DC), their migration to the T cell zone, and subsequent processing of Ag and its presentation to naive T cells (26). B cells are subsequently involved by acquiring Ag from follicular DC, presenting it in the context of MHC II to DC-activated T cells. Acquisition of Ag by B cells in the early stages of an immune response would result in cognate B and T cell interaction involving interaction of CD40L-expressing T cells with CD40 on the B cell and resulting in both MHC II and CD40-mediated B cell signaling. However, little is known whether activating signals following ligation of MHC II are regulated by prior signals from the BCR. A previous study (27) using the K46 B cell line has shown reciprocal desensitization of the BCR and MHC II. This suggests a significant cross-talk between these receptors. In the present study, we investigate the effects of BCR signaling on MHC II-induced intracellular Ca2+ response to evaluate possible cross-talk between these two receptors in nontransformed (primary) B cells. To this regard, we examined the effects of prior BCR ligation on the MHC II-induced Ca2+ response at early and late points after BCR ligation, 10 min or 150 min and overnight, respectively. Fig. 4⇓ shows analysis of the MHC II induced Ca2+ response following BCR ligation. As predicted, ligation of MHC II by the 11-5.2 mAb in the absence of other stimuli induced elevation of intracellular Ca2+. In contrast, when the cells were prestimulated with F(ab′)2 of goat anti-μ for 10 min, subsequent ligation of MHC II failed to result in a significant increase in the Ca2+ level at all doses of anti-MHC II mAb used (Fig. 4⇓a). As predicted, ligation with goat anti-μ Ab alone induced elevation in the Ca2+ response in these cells (Fig. 4⇓a, inset). To further confirm the results above and to mimic effects resulting from Ag binding to the BCR, the BCR was preligated with an anti-idiotypic mAb (7.6 mAb), which binds the HEL-specific BCR on B cells isolated from anti-HEL BCR transgenic mice. Ligation of the BCR with 7.6 mAb induced elevation of Ca2+ in these cells (Fig. 4⇓b, inset). To examine effects following incubation with 7.6 mAb, B cells were either preincubated with increasing concentrations of the 7.6 mAb or with an isotype matched control for 10 min followed by addition of 11-5.2 mAb and SA. 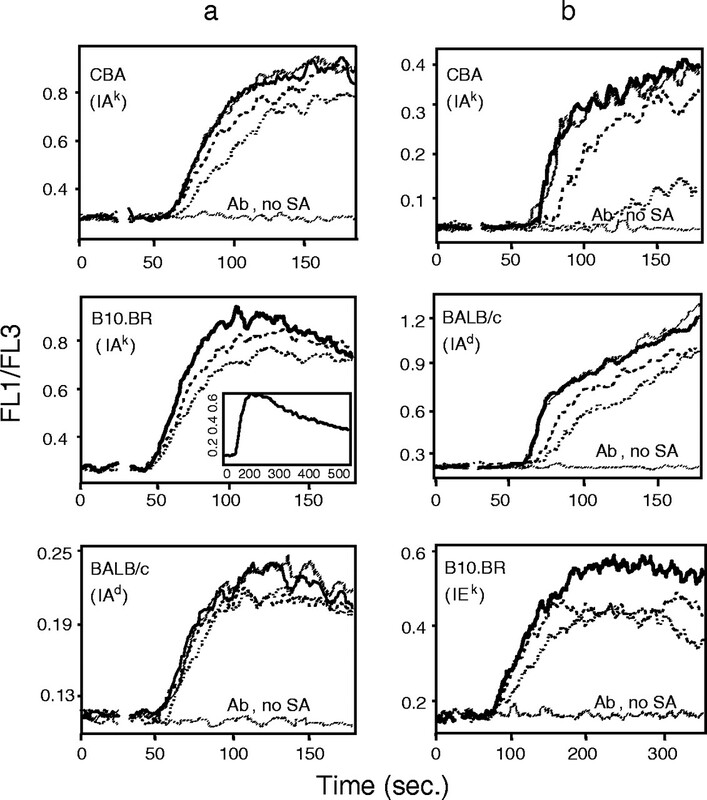 In the absence of BCR ligation (incubation with the isotype-matched control Ab), ligation of MHC II with 11-5.2 mAb induced mobilization of Ca2+ (Fig. 4⇓b). However, when cells were pretreated with 7.6 mAb, the Ca2+ response was significantly lower at all concentrations of the mAb used. These results confirm those obtained following preligation of the BCR with goat anti-μ Ab (Fig. 4⇓a). Ligation of the BCR regulates induction of MHC II-mediated Ca2+ signaling. Pure B cells were isolated from either HEL-specific BCR-transgenic mice (b and e) or their nontransgenic littermates (a, c, and d). Cells were incubated with either 10 μg/ml polyclonal goat anti-μ F(ab′)2 Ab (a, c, and d), with increasing concentrations of 2 (dashed line), 4 (solid line), or 8 (bold line) μg/ml (b), or 1 (dashed line), 5 (solid line), and 25 (bold line) μg/ml (e) of an anti-idiotypic mAb (7.6 mAb), or with 8 μg/ml 7.6 mAb isotype-matched control (IMC) (b). Cells were pretreated with anti-BCR Abs either for 10 min (a–c), 150 min (d), or overnight (e). B cells were then labeled with Ca2+ binding dyes (Fura Red = FL3 and Fluo3 = FL1). Cells were washed and rested for 30 min. FcγR was blocked with 2.4G2 mAb. Subsequently, increasing concentrations of 2.5 (dotted line), 5 (dashed line), and 10 (bold line) μg/ml biotin 11-5.2 (anti-IAk) (a) or 5 μg/ml of this mAb (b, d, and e) were incubated with the cells for 5 min to allow binding. A baseline response was established for 25 s, after which SA was added. Insets in a and b show direct stimulation of cells with 10 μg/ml polyclonal goat anti-μ F(ab′)2 and increasing concentrations of 2 (dashed line), 4 (solid line), and 8 (bold line) μg/ml 7.6 mAb, respectively. To examine whether pretreatment with goat anti-μ depletes Ca2+ from intracellular stores, cells were incubated with the Ab or left without treatment. A baseline response was established for 25 s, after which 0.4 μM thapsigargin, a potent releaser of intracellular Ca2+, was added (c). Shown are traces representing the average of Ca2+ oscillations. Data in (a–c) and (d and e) are representative of two and at least three similar experiments, respectively. Because the significant decrease in MHC II-induced mobilization of Ca2+ may be due to depletion of Ca2+ from intracellular stores following BCR ligation, B cells were either treated or not with goat anti-μ Ab for 10 min followed by pharmacological treatment with thapsigargin, a potent releaser of Ca2+ from intracellular stores. The rational is that if pretreatment with the anti-BCR Ab depletes Ca2+ from intracellular stores then the response to thapsigargin will be considerably diminished. As shown in Fig. 4⇑c, treatment with thapsigargin in the absence of prior anti-BCR ligation induced a significant release of Ca2+ as shown by its prolonged initial phase. Interestingly, prior treatment with anti-BCR Ab resulted in a further increase in the level of intracellular Ca2+ released by thapsigargin. This is presumably due to the opening of membrane Ca2+ channels following BCR ligation and subsequent influx of Ca2+ from the extracellular space. This latter finding is consistent with those reported in another study (27). The results above indicate that the inhibitory effects on MHC II-mediated mobilization of Ca2+ were unlikely due to the depletion of Ca2+ from intracellular stores following BCR ligation. To examine whether longer preincubation with anti-BCR Abs has similar effects on MHC II signaling as the short incubation time, B cells were pretreated with or without goat anti-μ for 150 min (Fig. 4⇑d) or with increasing concentration of 7.6 mAb overnight (Fig. 4⇑e). In both cases, prior anti-BCR ligation did not significantly inhibit elevation in Ca2+ level after subsequent MHC II ligation with 11-5.2 mAb. These results demonstrate that desensitization of MHC II Ca2+ signaling following ligation of the BCR occurs mainly at the early stages of B cell signaling. Overall, we conclude that early events following ligation of the BCR negatively influence MHC II-activating signals. This refractory period of MHC II signaling may be important to ensure the integrity of BCR-mediated signaling that lead to B cell activation before its encounter with T cells. Although the experiments above indicated that the timing of BCR ligation regulates MHC II-mediated intracellular Ca2+ signaling, the concerted effects of other signals, such as those following CD40 ligation, might also play a role. This situation is likely to arise when B cells primed with Ag encounter DC-activated and cognate T cells that express CD40L. CD40 signals are crucial for B cell proliferation, Ab secretion, class switching, and formation of germinal centers (28). Previous studies on B cell activation and differentiation have demonstrated synergism of each of the signals from the BCR and CD40 with those from MHC II (18, 19). Other studies found cross-talk between the BCR and CD40 at the intracellular molecular level (29, 30). However, how the three signals from MHC II, BCR, and CD40 are coordinated has not been addressed. To start investigating the effects resulting from prior ligation of the BCR and CD40 on the MHC II-induced Ca2+ response, we examined whether anti-CD40 mAb induces Ca2+ mobilization in the presence or in the absence of prior BCR ligation. In this regard, previous studies have shown that the use of plasma membrane extracts from activated Th cells fails to induce mobilization of Ca2+ in primary B cells (31). Consistent with the latter, the incubation of B cells with increasing concentrations of anti-CD40 Ab, including a physiologically activating dose of 4 μg/ml (that results in up-regulation of surface adhesion and activation markers on these cells (2)), did not induce mobilization of Ca2+ (Fig. 5⇓a). Furthermore, no elevation in intracellular Ca2+ in response to CD40 ligation was detected even under conditions where the BCR was preligated by either goat anti-μ or the 7.6 mAb (Fig. 5⇓, b and c, respectively). Moreover, a higher order of ligation of CD40 using a different mAb, biotin anti-CD40, and SA did not induce an elevation of Ca2+ (data not shown). We conclude that ligation of CD40 on B cells does not induce mobilization of intracellular Ca2+. Ligation of CD40 does not induce mobilization of Ca2+. Pure B cells were isolated from BCR-transgenic (c) or their nontransgenic littermates (a and b). Cells were either untreated (a) or pretreated with either 10 μg/ml polyclonal goat anti-μ F(ab′)2 (b) or 25 μg/ml 7.6 mAb overnight (c). Cells were then labeled with Ca2+ binding dyes, washed, and rested for 30 min. FcγR was blocked with 2.4G2 mAb. A baseline response was measured for 25 s followed by addition of increasing concentrations of 4 (dotted line), 8 (dashed line), or 16 (solid line) μg/ml anti-CD40 mAb. Inset in a show the Ca2+ response in these cells following ligation of the BCR with 10 μg/ml goat anti-μ. Shown are traces representing the average of Ca2+ oscillations. The data are representative of at least four similar experiments. To address how the signals from the BCR, CD40, and MHC II are coordinated, we tested the effects of ligation of the BCR, CD40, or BCR + CD40 on MHC II-mediated Ca2+ mobilization. As shown in Fig. 6⇓a, the activation of B cells by overnight incubation with increasing doses of the anti-BCR 7.6 mAb, followed by concurrent stimulation of the cells with anti-CD40 and biotin MHC II + SA, resulted in MHC II-derived mobilization of intracellular Ca2+. This sequence of signaling events mimic engagement of MHC II and CD40 on B cells by T cells during Ag presentation. To further examine possible cross-talk between the BCR and CD40, we looked at effects of simultaneous addition of Abs to these receptors on subsequent MHC II-induced mobilization of intracellular Ca2+. This mode of CD40 and BCR engagement could be envisaged where by standard activation of B cells occurs, for example, from engagement of CD40 by activated T cells involved in other immune responses. This sequence of signaling events resulted in much lower level of MHC II-derived Ca2+ compared with when B cells were stimulated with anti-CD40 or anti-μ alone (Fig. 6⇓b). The incubation with anti-CD40 alone did not inhibit subsequent BCR-mediated Ca2+ response (data not shown). It should be noted that the level of Ca2+ following the combined treatment was not abolished because basal mobilization of Ca2+ was still detectable (Fig. 6⇓b, also see 6c). Finally, the effects on the Ca2+ level were not due to differential loading of Ca2+ dyes, because when a potent Ca2+ ionophore was used, the magnitude of the intracellular Ca2+ response was similar in cells from the different treatments (inset in Fig. 6⇓b). MHC II-mediated mobilization of Ca2+ is regulated by simultaneous signals from the BCR and CD40. a, B cells were isolated from HEL-transgenic mice and incubated overnight with increasing concentrations of 1 (dotted line), 5 (dashed line), and 25 (solid line) μg/ml of an anti-idiotypic anti-μ mAb (7.6 mAb). Cells were then washed and labeled with Ca2+ binding dyes (Fura Red = FL3 and Fluo3 = FL1). Cells were washed and rested for 30 min. FcγR was blocked with 2.4G2 mAb. Subsequently, 5 μg/ml biotin 11-5.2 mAb (anti-IAk) and 4 μg/ml hamster anti-CD40 mAb were added simultaneously and incubated for 10 min to allow binding. A baseline response was measured for 25 s followed by addition of SA to ligate 11-5.2 mAb. b, B cells were stimulated overnight with 10 μg/ml polyclonal goat anti-μ + 4 μg/ml hamster anti-CD40, 10 μg/ml anti-μ, or 4 μg/ml anti-CD40. Cells were then washed and labeled with Ca2+ binding dyes. FcγR was blocked with 2.4G2 mAb. A baseline response was measured for 25 s followed by addition of 5 μg/ml biotin 11-5.2 mAb (anti-IAk) for 5 min to allow binding. Mobilization of Ca2+ was measured after addition of 10 μg/ml SA. c and d, B cells were isolated from HEL-transgenic mice and their nontransgenic littermates. Cells were incubated with either 100 nM (transgenic) or 100 μM (nontransgenic) of HEL in the presence of 4 μg/ml hamster anti-CD40 mAb (c) or in its absence (d). After overnight incubation, cells were washed and labeled with Ca2+ dyes. Mobilization of Ca2+ was measured as described above. Inset in b shows Ca2+ mobilization for each treatment after addition of 2 μl of 10 μg/ml Ca2+ ionophore. Shown are traces representing the average of Ca2+ oscillations. To further examine the physiological relevance of the above findings, B cells were isolated from transgenic mice in which the BCR is specific to HEL or from nontransgenic littermates that were used as a control for the absence of BCR-mediated signals. An activating dose of 100 nM HEL that engages the BCR or 100 μM HEL that results in fluid phase uptake and processing (2) were added in the presence of anti-CD40 mAb to transgenic and nontransgenic B cells, respectively. Cells were then incubated with the reagents overnight, washed, and labeled with Ca2+ dyes. The analysis presented in Fig. 6⇑c shows that preincubation of anti-HEL BCR transgenic cells with HEL and anti-CD40 resulted in much lower level of MHC II-mediated mobilization of Ca2+ compared with the nontransgenic littermates. 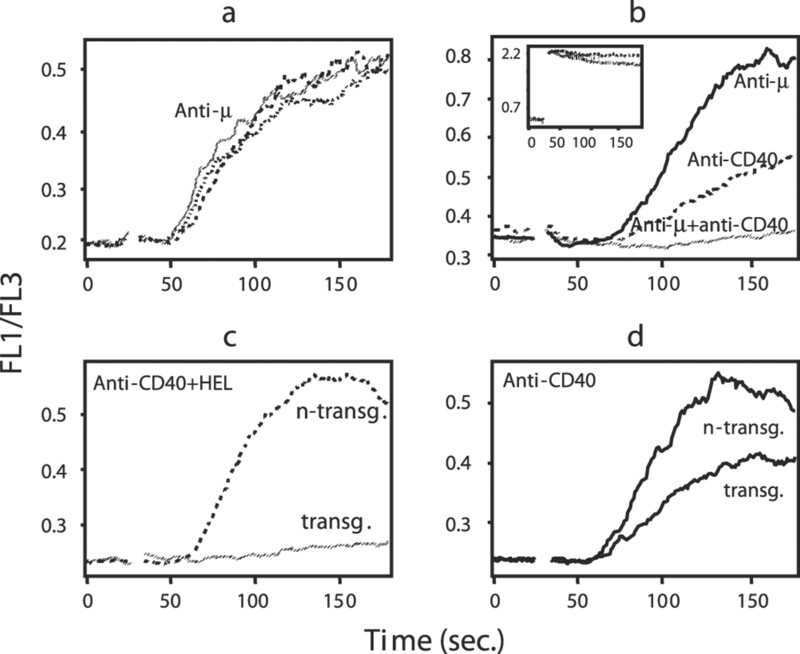 In contrast, MHC II ligation following incubation of either transgenic or nontransgenic B cells with anti-CD40 Ab alone induced significant mobilization of Ca2+ (Fig. 6⇑d). Thus, prior treatment of B cells with ligands that induce BCR and CD40 signals concomitantly before engagement of MHC II significantly down-regulates MHC II-mediated activating signals. To examine whether the inability of MHC II to signal for Ca2+, as above, has physiological consequences downstream of Ca2+ signaling, we investigated surface expression of MHC II and CD86 because it is widely known that ligation of either the BCR or CD40 alters expression of these molecules. Splenic B cells were treated with an activating dose of anti-CD40, anti-CD40 + anti-μ, or left untreated and incubated for 40 h. Following incubation, expression of MHC II and CD86 were examined by staining cells with fluorescent-labeled anti-MHC II or anti-CD86 Abs and subsequent analysis by flow cytometry. As expected, the incubation with anti-CD40 significantly up-regulated levels of MHC II and CD86 compared with medium (Fig. 7⇓). In contrast, cells treated with both anti-μ and anti-CD40 Abs had similar levels of MHC II expression as medium, whereas the level of CD86 expression was not affected by the treatment. These results demonstrate that the effects of concurrent ligation of the BCR and CD40 extends beyond MHC II-induced mobilization of Ca2+ into signaling pathways that affect expression of MHC II itself. Simultaneous ligation of the BCR and CD40 results in failure to up-regulate surface expression of MHC II. Pure B cells were isolated and incubated in medium, with hamster anti-CD40 or with hamster anti-CD40 + goat anti-μ F(ab′)2 for 40 h. Cells were then labeled with FITC anti-mouse MHC II or PE anti-mouse CD86 mAbs or their isotype matched controls (data not shown) and analyzed by flow cytometry. Analysis was performed on cells displaying high FSC. The data show specific down-regulation of MHC II on B cells when treated with the combined treatment of anti-CD40 and anti-μ Abs compared with treatment with anti-CD40 Ab alone. The data represent four similar experiments. Overall, we conclude that the MHC II-induced Ca2+ signal is regulated by the BCR and CD40. The signals from these receptors are coordinated as such to maximize and preserve the integrity of early BCR-activating signals and therefore to ensure that only appropriate B and T cell Ag-specific interactions are promoted. To address whether MHC II mobilization of Ca2+ has a physiological relevance in cognate B and T cell interaction, we performed single cell analysis of B cell Ca2+ response in the presence of T cells. Pure resting splenic B cells were loaded with HEL46–62 peptide and labeled with Fluo-3 Ca2+ dye. The T cell hybridoma H4Ly-50.5 that recognizes the HEL peptide in the context of IAk was used. Fig. 8⇓ shows time-lapse images of the earliest events of Ca2+ mobilization in B cells following addition of the APC to T cells fixed on coverslips. Fig. 8⇓a, top panels, shows mobilization of Ca2+ in B cells loaded with HEL peptide as detected 360 s after B and T cell interaction. In contrast, most B cells without the peptide did not interact, and when some B cells were in close proximity to the T cell membrane, no Ca2+ signal could be detected (Fig. 8⇓a, bottom panels). The kinetics of the interactions and induction of the Ca2+ response in B cells varied and was transient (data not shown). For example, mobilization of Ca2+ could be detected after a first round of interactions and/or after a second and sometimes a third round either as a result of interactions with the same T cell or this was followed by interactions with a neighboring T cell suggesting dynamic scanning of the T cell surface. The duration of each round of signal was ∼20–30 s. However, irrespective of the nature of these specific interactions, the data here support our conclusions on the MHC II-mediated mobilization of Ca2+ in resting B cells. Single cell imaging of Ca2+. a, The earliest stages of B cell Ca2+ signaling during cognate B and T cell interactions are shown in the presence (top panels) or absence (bottom panels) of synthetic HEL46–61 peptide. Pure resting B cells were pulsed with 300 μM HEL peptide and loaded with Fluo-3. Cells were then dropped over T cells that were made adherent to cover slips. Differential interference contrast images were superimposed on fluorescent cells to visualize interactions. The interval between two images is 120 s. b, Imaging of Ca2+ after stimulation of B cells with 11-5.2 mAb. Pure resting B cells were loaded with Fluo-3, coated with the anti-IAk biotin 11-5.2 mAb, then made adherent to slides. Fluorescence images were taken before (left panel) and after (right panel) addition of SA. Fig. 8⇑b shows Ca2+ mobilization in B cells that were preincubated with biotin 11-5.2 mAb, made adherent to slides, then stimulated with SA. In some cells, the Ca2+ signal was prolonged lasting for ∼150–200 s (data not shown). Addition of thapsigargin also resulted in sustained mobilization of Ca2+ (data not shown). These results confirm our flow cytometry data on the outcome of MHC II ligation by the 11-5.2 mAb and the prolonged kinetic of the Ca2+ response. Generation of MHC II-mediated B cell-activating signals following cognate T/B cell interaction is essential for B cell proliferation and differentiation. However, it is likely that a number of factors, including Ag processing, ligation of MHC-peptide complex, and signals from other receptors influence the nature of the MHC II-derived signals. In this case, it is possible that these factors impose certain forms of spatiotemporal molecular interactions between MHC II and other signaling molecules present in the membrane that subsequently dictate differences in the nature of the MHC II-mediated signals. This study, and results from our recent work (2), highlight the importance of the context in which MHC II mediate their signals as a perquisite for mobilization of intracellular Ca2+ and B cell survival. We show here that ligation of MHC II by specific mAbs or T cells induces mobilization of intracellular Ca2+ in resting unstimulated murine B cells. Furthermore, mobilization of Ca2+ is independent of the MHC II haplotype/isotype and is inhibited by inhibitors of src- and syk-tyrosine kinases, suggesting that MHC II is coupled to the PTK pathway in resting murine B cells. Moreover, elevation of Ca2+ is strictly regulated by signals from the BCR and CD40 suggesting coordination of the signals from these various pathways preserves the integrity of early BCR-mediated signaling events that are essential for B cell activation and for productive B and T cell Ag-specific interactions. Despite that numerous studies have shown that ligation of MHC II on resting human B cells couples MHC II to the PTK pathway and results in mobilization of Ca2+ (8, 20), studies in murine B cells were unable to demonstrate an increase in phosphotyrosine levels and mobilization of Ca2+ using specific mAbs directed against MHC II (15, 16). Instead, ligation of MHC II on resting mouse B cells has been shown to induce activation of PKC and its translocation to the nucleus (23), an event that has been linked to elevation in the level of cAMP (3). In this regard, agents that induce an increase in cAMP, including anti-MHC II mAbs, have been reported to inhibit mitogen- or anti-μ-induced B cell proliferation of resting B cells as well as mobilization of Ca2+ (21, 32), indicating that generation of cAMP is antagonistic to B cell activation and proliferation. Furthermore, MHC II-mediated activation of PKCβ, but not the Src family of PTK, has been linked to death of human B cells (33). However, others have demonstrated that mAbs directed to IEk, but not IAk, induce cAMP and subsequent differentiation of B cells (4). It is interesting in this regard that an elevation in cyclic AMP has not been demonstrated following MHC II ligation on human B cells. Furthermore, it is clear that anti-MHC II mAbs that have different haplotype specificity are able to induce mobilization of Ca2+ (Fig. 1⇑). Mobilization of Ca2+ can also be induced by Ca2+ ionophores, which (in the concomitant presence of phorbol esters) stimulates B cell proliferation (34). These results suggest that there are different thresholds for elevation of either intracellular cAMP or Ca2+ in resting mouse B cells that depends on the nature of ligation of MHC II by different mAbs. In this study, we highlight the differential effects resulting from the use of different mAbs specific for the same haplotype on mobilization of MHC II-derived Ca2+ signaling and generation of downstream signals that result in enhanced expression of costimulatory molecules such as CD86. Our analysis of the effects of different anti-MHC II mAbs on mobilization of Ca2+ suggests that epitope specificity of the anti-MHC II mAbs and/or the nature of MHC II ligation may be important in determining the response of the cell. In contrast to the results obtained with the 11-5.2 and 14-4-4S anti-MHC II mAbs, ligation of MHC II with the 10-3.6 and 10-2.16 mAbs did not induce mobilization of Ca2+. The former mAbs are specific to the α-chain of MHC II while both 10-3.6 and 10-2.16 react with the β-chain. It is interesting in this regard that the β-chain has been shown to be essential for PKC translocation to the nucleus following ligation of MHC II by 10-3.6, 10-2.16, and D3.137 mAbs (the chain specificity of D3.137 is unknown) (23). Analysis of MHC II structural requirements for induction of signals also revealed that deletion of the entire cytoplasmic tails of α- and β-chains in mouse and human B cells does not affect coupling of MHC II to the PTK pathway, although the cytoplasmic β-chain domain was required for cAMP and PKC translocation to the nucleus (5, 35). Overall, these studies suggest that the cytoplasmic tails of MHC II are minimally involved in mechanisms that lead to mobilization of Ca2+ in B cells. Alternatively, it is likely that the transmembrane or extracellular domains of MHC II mediate elevation of Ca2+. The transmembrane sequences of both the α- and β-chain of class II are critical for class II-mediated phosphotyrosine induction, which can be inhibited by point mutagenesis of these domains (36). Thus, mobilization of Ca2+ following ligation of MHC II appears to involve the transmembrane or extracellular region, and induction or absence of Ca2+ signaling following ligation of anti-MHC II α- and β-chain mAbs may be explained by the nature of ligation of MHC II subunits by different mAbs. This could result in specific orientation of α- and β-chains that could be responsible for differential association with resident signaling molecules in the plasma membrane. The studies above support the view that molecular interactions in the plasma membrane dictate MHC II-mediated Ca2+ signaling. Indeed, relevant microdomains containing peptide-MHC have been shown to interact with CD82 and other members of the tetraspan family of integral membrane proteins (37). MHC II has also been shown to associate with CD19 and CD20, molecules that may couple MHC II to the PTK-signaling pathway (9). Mobilization of Ca2+ in this study necessitated ligation of prebound anti-MHC II mAbs, which is consistent with previous reports (15, 27). Furthermore, evidence has been presented that association of MHC II with membrane microdomains can contribute to their aggregation and mediate coupling to the PTK pathway (38). Thus, the failure of unligated anti-MHC II mAbs to mobilize Ca2+ suggests that elevation of Ca2+ requires interaction of MHC II with signaling molecules that are not at immediate proximity but brought closer within the same or different plasma membrane microdomains. In comparison, induction of MHC II-mediated increase in phosphotyrosine levels in human B cells appears to be due to interaction with CD20 that is closely associated with MHC II (9). Our data on the induction of Ca2+ from MHC II and the inhibition of this response by inhibitors of tyrosine kinases support the view that interactions between MHC II and signaling components of the plasma membrane are likely to be important for mediating increase in phosphotyrosine levels and mobilization of Ca2+ in resting unstimulated mouse B cells. Because engagement of MHC II by the TCR is a subsequent event to B cell priming by Ag, there should be mechanisms that ensure integrity of early BCR-mediated signals that lead to B cell activation before generation of MHC II signals. Similarly, other activating signals such as those from CD40 should not interfere with early events of B cell priming by Ag. Indeed, nonspecific presentation of Ag such as following fluid phase uptake of HEL leads to significant B cell death following cognate B and T cell interaction (1, 2). These latter mechanisms would reinforce the notion that nonspecific activation of B cells does not result in productive immune responses. A previous study (27) has shown reciprocal desensitization of the BCR and MHC II in K46 B cell line indicating a significant cross-talk between these receptors. In this study, we confirm these findings by showing that prior ligation of the BCR for a short time (an event that leads to generation of Ca2+ and elevation in overall phosphotyrosine levels) before ligation of MHC II, significantly diminish mobilization of Ca2+ (Fig. 4⇑, a and b). The desensitization of MHC II following ligation of the BCR suggests that early signaling events that lead to increased phosphotyrosine levels and generation of Ca2+ are shared between the BCR and MHC II. However, in addition, we show that under conditions that allow extended time of B cell priming, MHC II desensitization no longer occurs (Fig. 4⇑, d and e). This suggests that once early events of phosphorylation of signaling substrates and generation of Ca2+ occur, subsequent events that lead to B cell activation and differentiation do not interfere with MHC II-derived activating signals. Indeed, it is shown here (Fig. 6⇑a) that prior BCR ligation followed by concurrent ligation of MHC II and CD40 induces a significant mobilization of Ca2+. In contrast, prior simultaneous ligation of the BCR and CD40 results in a significant decrease in the level of subsequent MHC II-mediated mobilization of intracellular Ca2+ compared with prior ligation of either receptor alone. Furthermore, this procedure resulted in the inability of B cells to up-regulate MHC II expression above basal level (Fig. 7⇑) that was nevertheless sufficient to induce mobilization of Ca2+ upon its cross-linking (Fig. 6⇑, b and c). The precise mechanisms responsible for the reduced MHC II-derived mobilization of Ca2+ and downstream effects on MHC II expression are not clear and would be interesting to reveal. One possibility is that the availability of CD79 substrate might play a role in the observed desensitization of MHC II. Additionally, it is noted that prior ligation of the BCR does not affect subsequent induction of MHC II-derived Ca2+ in the presence of anti-CD40 Ab (Fig. 6⇑a). Moreover, anti-CD40 Abs do not induce mobilization of Ca2+ (Ref.30 ; Fig. 5⇑), and CD40-associated signaling molecules (TNFR-associated factors) do not contain tyrosine activation motifs (39) that would enable interaction with molecules containing Src homology 2 domains. These data in addition to the finding that CD86 expression, which strongly correlates with level of Ca2+ in B cells (24), remained unaffected by simultaneous ligation of BCR and CD40 suggest that the inhibitory effects on MHC II expression are independent of Ca2+. In this context, recent studies highlighted differences between mechanisms that couple the BCR and CD40 signaling events to the same signal transduction pathway downstream of Ca2+ (40, 41). Ligation of the BCR, but not CD40, induced tyrosine phosphorylation of the Src homology C adaptor molecule that couples these receptors to Ras-dependent signaling pathways (40). Furthermore, although signals from the BCR and CD40 synergize to activate ERK, this occurs largely independent of PI3K and phospholipase Cγ (41). Thus, it is likely that the inhibitory effects on the expression of MHC II observed above are as a result of cross-talk that involve signaling molecules downstream of Ca2+ induction. This mechanism would ensure uncoupling of early BCR and MHC II-mediated signaling events that lead to B cell priming from subsequent CD40-mediated differentiation signals. Moreover, these findings might be viewed in the context of Ag presentation to T cells because central cluster formation involving the APC and T cell is based on a transport process sensitive to MHC-peptide strength and number (42). A significant reduction in the number of MHC II in the membrane microdomains would be expected to destabilize formation of such synapse. Results from our previous study (2) showed that ligation of MHC II-peptide complexes formed via distinct Ag processing pathways (BCR vs fluid phase uptake) by either specific mAb or the TCR in Ag presentation assay had differential effects on B cell survival. Thus, ligation of MHC II-peptide complexes formed via BCR-mediated uptake promoted B cell survival, whereas similar treatment of complexes generated following fluid phase uptake of Ag resulted in 50–100% B cell loss. A more dramatic B cell loss (up to 100%) was evident in cultures of B and T cells compared with direct ligation of MHC-peptide complexes by a specific mAb (50%). These results suggested the contribution of adhesion molecules in the outcome of B cell survival, particularly that expression of adhesion molecules, on the surface of B cells, and formation of cognate B and T cell conjugates was reduced significantly. Furthermore, B cell loss occurred in the presence of comparable levels of T cell division in both cultures, indicating that B cell death occurred after formation of MHC-peptide complexes and T cell stimulation. Based on our previous results (2) and the results reported in this study on the ability of anti-MHC II mAbs and cognate T cells to induce mobilization of Ca2+ in resting B cells, we propose a model in which the context of MHC II-peptide complexes in the plasma membrane (in association with other signaling proteins) and the mode of MHC II ligation dictate generation of activation signals in B cells and their survival. First, the uptake and processing of Ag via the BCR generate MHC II-peptide complexes leading to their “appropriate” targeting to the plasma membrane and signaling leading to initial activation of B cells. Ligation of these complexes by the TCR induces further signaling, including mobilization of Ca2+, and thus contributes to full B cell activation. Signals via CD40 in the presence of synergistic effects of IL-4 would further induce Ab class switching and B cell differentiation. This process is strictly regulated in that engagement of MHC II shortly after Ag binding to the BCR or aberrant simultaneous engagement of CD40 and the BCR would induce desensitization of MHC II. Second, nonspecific uptake and processing of Ag (e.g., following fluid phase uptake) generates MHC II-peptide complexes that upon their ligation by T cells induces signaling in which the nature of signals is dependent on the mode of MHC II ligation. The outcome of this interaction would be ineffective B cell activation presumably due to lack of sustained Ca2+ signals due to significantly reduced B and T cell conjugate formation as a result of reduced expression of adhesion molecules (2). This model predicts that in cognate B-T cell interactions, BCR signaling and processing of Ag dictates the nature of MHC II-peptide complexes, their appropriate targeting to the plasma membrane, MHC II-derived signals, and signals from other receptors. Furthermore, the mode of ligation of MHC II-peptide complexes by the TCR contributes to the outcome of B cell signaling. This model also accommodates findings in other APC such as in mature DC that are known to undergo cell death following Ag presentation (43). In the latter case, nonspecific uptake and processing of Ag may lead to “inappropriate” targeting of MHC II-peptide complexes and as a result may contribute to DC death and termination of immune responses. This BCR-controlled process will ensure that appropriate B and T cell Ag-specific interactions occur and would be important in mechanisms that regulate immunity and tolerance. We thank Dr. Mark Preissler and Adriana Caballero for comments on the manuscript, Lisa Drake and Kathleen Isles for maintaining the MD4 mouse colony, and Dr. Joseph Mazurkiewicz for help with confocal microscopy. ↵1 This work is supported by National Institutes of Health Grant A1-46405 (to J.R.D.). ↵4 Abbreviations used in this paper: MHC II, MHC class II; HEL, hen egg lysozyme; IC, isotype control; SA, streptavidin; PTK, protein tyrosine kinase; PKC, protein kinase C; DC, dendritic cell. Setterblad, N., V. Blancheteau, A. Delaguillaumie, F. Michel, S. Becart, G. Lombardi, O. Acuto, D. Charron, N. Mooney. 2004. 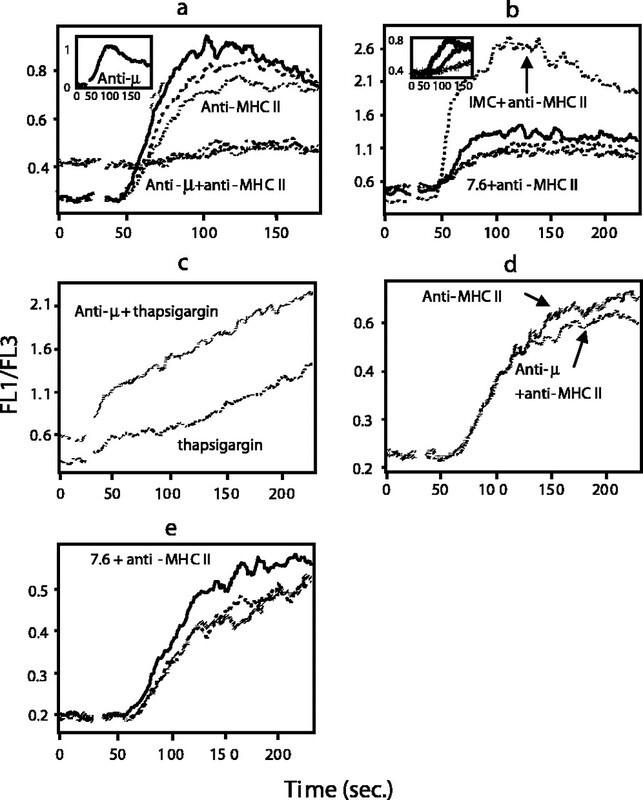 Cognate MHC-TCR interaction leads to apoptosis of antigen-presenting cells. J. Leukocyte Biol. 75: 1036-1044. Nashar, T. O., J. R. Drake. 2005. The pathway of antigen uptake and processing dictates MHC class II-mediated B cell survival and activation. J. Immunol. 174: 1306-1316. Cambier, J. C., M. K. Newell, L. B. Justement, J. C. McGuire, K. L. Leach, Z. Z. Chen. 1987. Ia binding ligands and cAMP stimulate nuclear translocation of PKC in B lymphocytes. Nature 327: 629-632. Bishop, G. A.. 1991. Requirements of class II-mediated B cell differentiation for class II cross-linking and cyclic AMP. J. Immunol. 147: 1107-1114. Andre, P., J. C. Cambier, T. K. Wade, T. Raetz, W. F. Wade. 1994. Distinct structural compartmentalization of the signal transducing functions of major histocompatibility complex class II (Ia) molecules. J. Exp. Med. 179: 763-768. Morio, T., R. S. Geha, T. A. Chatila. 1994. Engagement of MHC class II molecules by staphylococcal superantigens activates src-type protein tyrosine kinases. Eur. J. Immunol. 24: 651-658. Kanner, S. B., L. S. Grosmaire, J. Blake, G. L. Schieven, S. Masewicz, N. Odum, J. A. Ledbetter. 1995. Zap-70 and p72syk are signaling response elements through MHC class II molecules. Tissue Antigens 46: 145-154. Lane, P. J., F. M. McConnell, G. L. Schieven, E. A. Clark, J. A. Ledbetter. 1990. The role of class II molecules in human B cell activation: association with phosphatidyl inositol turnover, protein tyrosine phosphorylation, and proliferation. J. Immunol. 144: 3684-3692. Leveille, C., J. G. Castaigne, D. Charron, R. Al-Daccak. 2002. MHC class II isotype-specific signaling complex on human B cells. Eur. J. Immunol. 32: 2282-2291. Trede, N. S., E. Castigli, R. S. Geha, T. Chatila. 1993. Microbial superantigens induce NF-κB in the human monocytic cell line THP-1. J. Immunol. 150: 5604-5613. Trede, N. S., T. Chatila, R. S. Geha. 1993. Activator protein-1 (AP-1) is stimulated by microbial superantigens in human monocytic cells. Eur. J. Immunol. 23: 2129-2135. Ostrand-Rosenberg, S., S. Baskar, N. Patterson, V. K. Clements. 1996. Expression of MHC class II and B7-1 and B7-2 costimulatory molecules accompanies tumor rejection and reduces the metastatic potential of tumor cells. Tissue Antigens 47: 414-421. Mourad, W., R. S. Geha, T. Chatila. 1990. Engagement of major histocompatibility complex class II molecules induces sustained, lymphocyte function-associated molecule 1-dependent cell adhesion. J. Exp. Med. 172: 1513-1516. Truman, J. P., M. L. Ericson, C. J. Choqueux-Seebold, D. J. Charron, N. A. Mooney. 1994. Lymphocyte programmed cell death is mediated via HLA class II DR. Int. Immunol. 6: 887-896. Cambier, J. C., D. C. Morrison, M. M. Chien, K. R. Lehmann. 1991. Modeling of T cell contact-dependent B cell activation: IL-4 and antigen receptor ligation primes quiescent B cells to mobilize calcium in response to Ia cross-linking. J. Immunol. 146: 2075-2082. Lang, P., J. C. Stolpa, B. A. Freiberg, F. Crawford, J. Kappler, A. Kupfer, J. C. Cambier. 2001. TCR-induced transmembrane signaling by peptide/MHC class II via associated Ig-α/β dimers. Science 291: 1537-1540. Guo, W., W. Mourad, D. Charron, R. Al-Daccak. 1999. Ligation of MHC class II molecules differentially up-regulates TNF-β gene expression in B cell lines of different MHC class II haplotypes. Hum. Immunol. 60: 312-322. Baluyut, A. R., B. Subbarao. 1988. The synergistic effects of anti-IgM and monoclonal anti-Ia antibodies in induction of murine B lymphocyte activation. J. Mol. Cell. Immunol. 4: 45-57. Bishop, G. A., W. D. Warren, M. T. Berton. 1995. Signaling via major histocompatibility complex class II molecules and antigen receptors enhances the B cell response to gp39/CD40 ligand. Eur. J. Immunol. 25: 1230-1238. Mooney, N. A., C. Grillot-Courvalin, C. Hivroz, L. Y. Ju, D. Charron. 1990. Early biochemical events after MHC class II-mediated signaling on human B lymphocytes. J. Immunol. 145: 2070-2076. Muthuswamy, N., A. R. Baluyut, B. Subbarao. 1991. 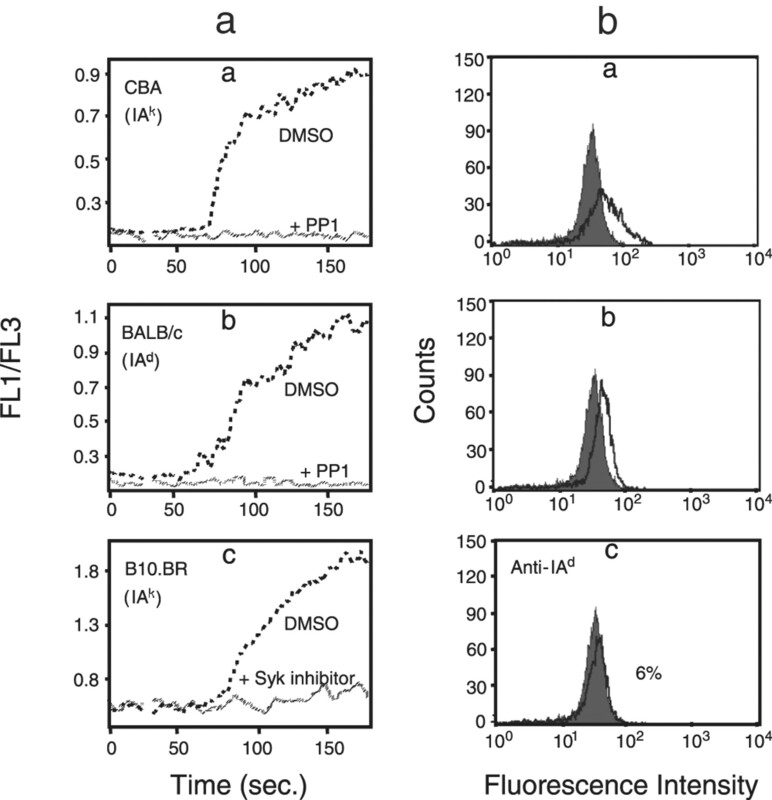 Differential regulation of surface Ig- and Lyb2-mediated B cell activation by cyclic AMP. I. Evidence for alternative regulation of signaling through two different receptors linked to phosphatidylinositol hydrolysis in murine B cells. J. Immunol. 147: 2483-2492. Greer, S. F., J. Lin, C. H. Clarke, L. B. Justement. 1998. Major histocompatibility class II-mediated signal transduction is regulated by the protein-tyrosine phosphatase CD45. J. Biol. Chem. 273: 11970-11979. Chen, Z. Z., J. C. McGuire, K. L. Leach, J. C. Cambier. 1987. Transmembrane signaling through B cell MHC class II molecules: anti-Ia antibodies induce protein kinase C translocation to the nuclear fraction. J. Immunol. 138: 2345-2352. Natarajan, K., N. C. Sahoo, K. V. Rao. 2001. Signal thresholds and modular synergy during expression of costimulatory molecules in B lymphocytes. J. Immunol. 167: 114-122. Dal Porto, J. M., S. B. Gauld, K. T. Merrell, D. Mills, A. E. Pugh-Bernard, J. Cambier. 2004. B cell antigen receptor signaling 101. Mol. Immunol. 41: 599-613. Bobbitt, K. R., L. B. Justement. 2000. Regulation of MHC class II signal transduction by the B cell coreceptors CD19 and CD22. J. Immunol. 165: 5588-5596. Haxhinasto, S. A., G. A. Bishop. 2004. Synergistic B cell activation by CD40 and the B cell antigen receptor: role of B lymphocyte antigen receptor-mediated kinase activation and tumor necrosis factor receptor-associated factor regulation. J. Biol. Chem. 279: 2575-2582. Mizuno, T., T. L. Rothstein. 2005. B cell receptor (BCR) cross-talk: CD40 engagement enhances BCR-induced ERK activation. J. Immunol. 174: 3369-3376. Marshall, L. S., D. M. Shepherd, J. A. Ledbetter, A. Aruffo, R. J. Noelle. 1994. Signaling events during helper T cell-dependent B cell activation. I. Analysis of the signal transduction pathways triggered by activated helper T cell in resting B cells. J. Immunol. 152: 4816-4825. Forsgren, S., G. Pobor, A. Coutinho, M. Pierres. 1984. The role of I-A/E molecules in B lymphocyte activation. I. Inhibition of lipopolysaccharide-induced responses by monoclonal antibodies. J. Immunol. 133: 2104-2110. Guo, W., J. G. Castaigne, N. Mooney, D. Charron, R. Al-Daccak. 2003. Signaling through HLA-DR induces PKCβ-dependent B cell death outside rafts. Eur. J. Immunol. 33: 928-938. Truneh, A., F. Albert, P. Golstein, A. M. Schmitt-Verhulst. 1985. Early steps of lymphocyte activation bypassed by synergy between calcium ionophores and phorbol ester. Nature 313: 318-320. Rich, T., S. E. Lawler, J. M. Lord, V. M. Blancheteau, D. J. Charron, N. A. Mooney. 1997. HLA class II-induced translocation of PKCα and PKCβ II isoforms is abrogated following truncation of DRβ cytoplasmic domains. J. Immunol. 159: 3792-3798. Harton, J. A., A. E. Van Hagen, G. A. Bishop. 1995. The cytoplasmic and transmembrane domains of MHC class IIβ chains deliver distinct signals required for MHC class II-mediated B cell activation. Immunity 3: 349-358. Kropshofer, H., S. Spindeldreher, T. A. Rohn, N. Platania, C. Grygar, N. Daniel, A. Wolpl, H. Langen, V. Horejsi, A. B. Vogt. 2002. Tetraspan microdomains distinct from lipid rafts enrich select peptide-MHC class II complexes. Nat. Immunol. 3: 61-68. Huby, R. D., R. J. Dearman, I. Kimber. 1999. 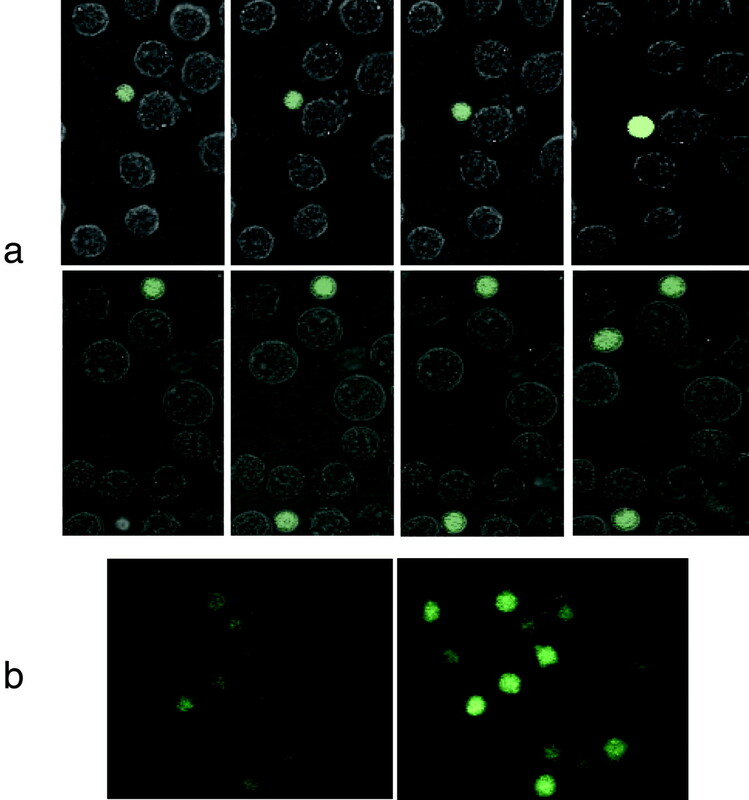 Intracellular phosphotyrosine induction by major histocompatibility complex class II requires co-aggregation with membrane rafts. J. Biol. Chem. 274: 22591-22596. Purkerson, J. M., D. C. Parker. 1998. Differential coupling of membrane Ig and CD40 to the extracellularly regulated kinase signaling pathway. J. Immunol. 160: 2121-2129. Mizuno, T., T. L. Rothstein. 2005. B cell receptor (BCR) cross-talk: CD40 engagement enhances BCR-induced ERK activation. J. Immunol. 174: 3369-6070. Matsue, H., D. Edelbaum, A. C. Hartmann, A. Morita, P. R. Bergstresser, H. Yagita, K. Okumura, A. Takashima. 1999. Dendritic cells undergo rapid apoptosis in vitro during antigen-specific interaction with CD4+ T cells. J. Immunol. 162: 5287-5298.